once again show we can do what we set out to do. To the community and the Learning Center in Copey, rest assured we are your “Friends” and look eagerly towards continuing our partnership with great expectations. The Learning Center is at work making a real difference in lives. This is a very encouraging result and amazing how both past donors decided to continue their support and having new donors show up. I can only promise that we will do all we can in 2016 to make our involvement exciting, productive, and successful. I am unaware of any other “organization” such as ours working in this fashion successfully with a small rural community. Thank You! Now we can continue moving ahead with our other fundraising campaign to help fund our Executive Director’s position. The Anne G. Broady Scholarship Fund…. “Friends”, I want to provide you a mid-week update on our progress towards reaching our Anne G. Broady Scholarship Goal. “Love the beautiful photograph of Tatiana. What a joy! Thank you to our friend Stephanie T. for becoming a new friend and for supporting these wonderful students and their teachers and volunteers. Thank you, Arthur, for your support of Lexie and for all that you do. You are right, We CAN do this! Dave and I will make our next donation in honor of our son, Jim, who is trying to return to Spain and teach English as a second language. He studied in Ronda, Spain during his last year of college a few years back. Thank you Lisa B. You truly are among our most dedicated “Friends”. You are a highly recognized public school teacher currently serving as a traveling elementary music teacher, an accomplished and successful musician and songwriter, a Pen Pal leader, and much more. Because of you, Lexie and other young students are getting involved with the Learning Center. Lisa’s full message is located under “Recent Comments”. Final Report for the AGB Scholarship Fund is February 1. Let’s proclaim our “Victory”! See the last Post for guidelines on making a donation or contact me at atbroady@aol.com for assistance. Thanks to all the “Friends”. “Friends”, we are happy to report some progress in both of our fundraising campaigns during this past week. I am very appreciative to those who have quickly responded and are helping move the needle closer to our goals. Those planning to donate are asked to do so soon. Our deadline is February 1 for the AGB Scholarship Fund. I know these times are financially difficult for most of us and there are already plenty of other needs brought to our attention almost daily. However, “Friends of Copey” has been about “faith” and “believing” in what we are doing. We beat the odds each day since we are not set up or operate as a traditional or conventional organization. 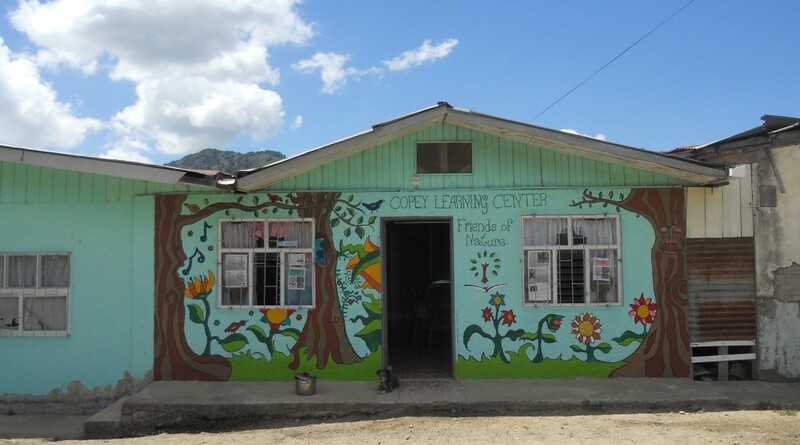 By design, every penny raised goes directly to the Learning Center solely for the purpose to support the Copey community’s efforts to better educate and prepare their children to meet the educational and occupational challenges awaiting them. So, I continue to encourage you to keep the faith and believe we have and can continue making a difference as “Friends”. Instructions for donating are at the bottom of this Post. WE can do this! February 1 is very doable. Several “Friends” and even a few “new” Friends have pledged to donate but we need to have the scholarship funds in place by February 1. The Learning Center needs some time to select recipients and award the scholarships before school starts February 15.
additional funds. The challenge has been met by our “new” Friend Stephanie T. from Hampton, Virginia with her generous donation. Thank you all for your generosity. Shown here is Tatiana. She was Lisa’s sponsored student in 2015. 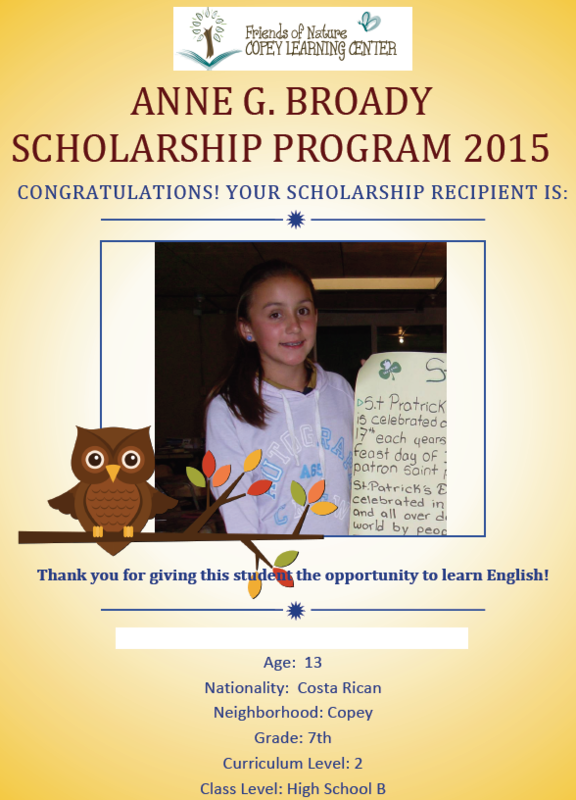 Lisa’s support helped Tatiana earn “Star Student” recognition. The needle moved upward some and I expect to see much better results soon. There are several pledges made but not yet received. This campaign does not end on February 1 so there is additional time. However, achieving this goal is of great importance as I explained in last week’s Post. have Pen Pal Letters all ready to send to their new friends. This will be a wonderful “back to school” surprise waiting for the Copey students. We plan to try again to have some face to face time using Skype. “Lexie”, our 9 year old Pen Pal friend from Sugar Grove Elementary School, is today an official donor. She and I will share a recipient in 2016. This should be very exciting. The Learning Center’s PayPal can be used to make donations directly. Please access the PayPal system by clicking on….http://copeylearningcenter.org/. Find the PayPal logo in the upper right hand corner of their homepage. To make certain the Learning Center recognizes your donation and how it should be applied, indicate in the comment section that the donation supports the “AGBSF” or the “EDF” (Executive Director Fund). Lexie, a 9 year old elementary music student and Pen Pal in Virginia, submitted a few comments this past week on my Blog. She and her classmates were introduced to the Learning Center students through our Pen Pal program. Apparently, she discovered how to add comments to the “Comments” section of the Blog and decided to correspond with me. Her message really touched my heart. She is the youngest person to send me such a note and her message is a powerful reminder of the spirit behind this project. Lexie also wrote; “I will try to donate i am only 9!!! But i love doing this type of stuff“. I answered Lexie’s note and promised to let the students at the Learning Center know how much she wants to help and I promised to find her a personal friend in the Learning Center to correspond with her when the Learning Center reopens in February. Also, I plan to donate funds to the AGB Scholarship Fund on behalf of Lexie so she can actually experience supporting a student (hopefully her new friend). Remember my words…2016 is going to be one unbelievable year with bold things happening. I invite you to be a part of it! Scholarship Fund. Previous donor “Friends” are asked to continue supporting this scholarship fund and new “Friends” are invited to join in. Getting as many children into the Learning Center as possible is our sole purpose for the scholarships. All the other things we do as “Friends” will not matter as much if the children are not enrolled and attending classes. We are making progress towards our Goal. Our 2nd fundraising campaign is also showing progress. It is essential to continue funding the only paid position for the Learning Center. Special projects are underway including a new Learning Center facility we hope will be ready in time for opening day in February. The town’s government and its citizens are willing to invest property and resources to help the Learning Center because of the progress of the Learning Center and its positive appearance of stability and continuity. Angela is part of the community and very experienced. She has her BA in International Affairs from Juniata College, in Huntingdon, Pennsylvania and very close to completing her Masters. She has taught English in China, in Ecuador, and taught in the public high school in Copey during 2010-2012 as a Peace Corps volunteer. 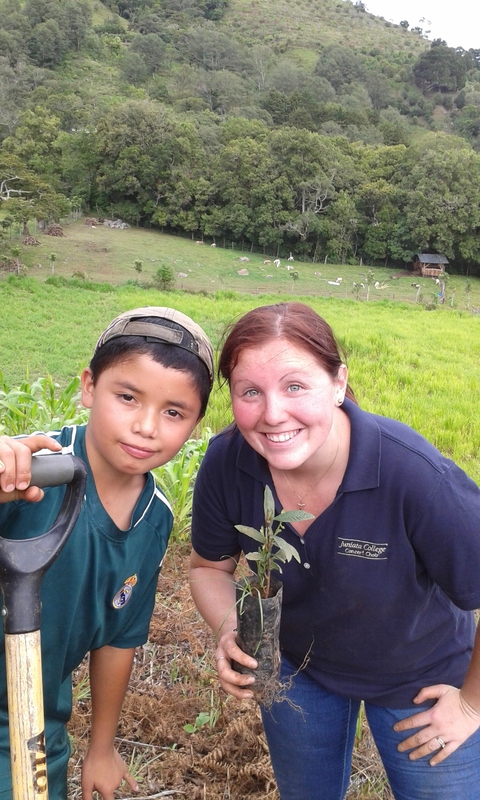 Before returning to Copey to assume the leadership at the Learning Center in 2015, she worked in the country’s capital, San Jose as a Peace Corps Volunteer Leader and in Costa Rica’s Ministry of Public Education’s National Headquarters. As I am completing my first year of experience working with Angela, I can attest to her devotion and commitment to the Learning Center. She is very involved with Emory & Henry College staff in preparation for the arrival of E&H College student volunteers going to work at the Learning Center later in the spring. She is helping get two of her students prepared to travel and study at E&H College in the summer. These are just examples of the projects we all are looking forward to in 2016 and Angela is key to this success. “Friends” is committed to cover about 40% of the total salary. Anyone inclined to support this campaign is invited to do so. Any amount is welcomed! worked at the Learning Center during the last half of 2015. This is really great news! This is another sign of continuity and consistency for the Learning Center. The students and the community will benefit and the start up in February is expected to be picking up where things were in November. . Welcome Back! The Copey community spent the weekend doing their own fundraising activities. With the very low income levels in Copey and being in a remote location, raising money among themselves and from nearby communities is a very difficult task. However, the community makes every effort to do all it can to help itself. They appreciate “Friends” being willing to support them. “Friends” is on the verge of significant achievements! Thanks to All….